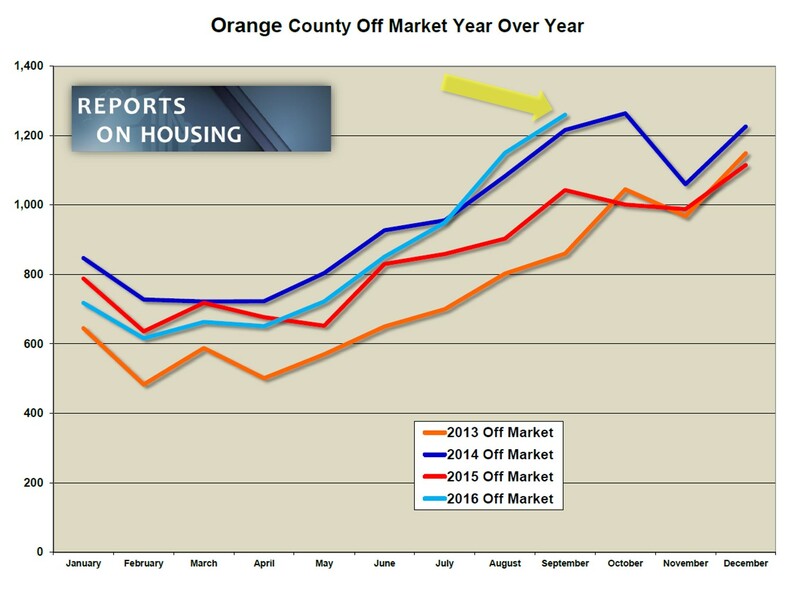 The 2016 Orange County housing market has been incredibly hot, yet there are plenty of unsuccessful sellers. The housing market has been HOT this year. As a matter of fact, current demand is up 13% year over year. The inventory has been way below the long term average, homes have flown off the market, multiple offers are still the norm, and homes are fetching values very close to their asking prices. Yet, through September, there were still 7,577 sellers who were not successful and pulled their homes off the market, 7% more than last year. What gives? If the market is blazing hot, why in the world wouldn’t every seller be successful? There are many reasons why homes don’t sell, even in an environment where supply is low and demand is high; but, the number one reason boils down to over exuberant sellers. Buyers are just not that willing to stretch too far above the most recent comparable sale. This is not just a luxury market phenomenon. 48% of all homes pulled off the market could be found below $750,000, and 66% were below $1 million. There were plenty of unsuccessful sellers in the hottest ranges. Even the sizzling hot price range below $500,000, where the expected market time has been less than 2 months all year long, experienced a lack of success. 1,667 sellers pulled their homes off the market in this range, or 22% of all unsuccessful sellers. Price is the biggest bellwether in successfully selling a home. Many homeowners come on the market feeling that their home is the absolute best in the neighborhood, and, therefore, should fetch the highest sales price, more than the most recent comparable sale. This leads to stretching the price too high and pushes away buyers from writing an offer. A brilliant strategy is to price a home very close to the most recent comparable or pending sale. Typically, this approach results in multiple offers. Multiple offers can be leveraged to procure negotiated prices above the asking price. Another strategy is to offer a little less than the last comparable or pending sale, leading to even more offers to purchase. This approach quickly can turn into a bidding war for a home and often results in negotiated prices way above the asking price. Instead, most sellers initially opt to overprice their home. In tracking the sales to list price ratio, sellers are fetching values very close to their asking prices. But, if you look at the Sales to the Original List Price Ratio and compare it to the Sales to Last List Price Ratio, the higher the price, the more a home had to reduce the price in order to find success. For example, a home originally priced at $850,000, on average, had to reduce the price to $838,000, ultimately selling for $826,000. Sellers take a look at the most recent comparable pending and closed sales and then justify a higher asking price for their home. They want a little extra cushion for negotiations. They also feel their home is the best in the neighborhood and will bring them a record price. Both result in overpricing and prevent a home from obtaining any offers. Consequently, they will have to reduce the asking price to be in alignment with the Fair Market Value; or, ultimately, they will have to pull their home off the market. Pricing is essential and homeowners need to lean on the expertise of a professional, their REALTOR®, or they risk wasting their time and energy in preparing and exposing their home to the market for a lengthy period of time.